This morning the Bank of International Settlements released its Triennial FX survey which is basically the market’s benchmark for forex volume and turnover. To no one’s surprise, volume has surged over the past 3 years. Between April 2007 and April 2010, global foreign exchange market increased by 20 percent from $3.3 trillion to $4.0 trillion, which is now the golden number for forex volume. Reading between the lines, we can tell that a large part of the increase in volume is due to the trading activities of RETAIL traders! (Yes, we are making a BIG difference) According to the BIS report, 48% of the growth was in spot transactions which represents 37% of the total turnover (or total FX flow). Although swaps became more popular to trade, all other related foreign exchange instruments saw only a 7 percent increase in volume. The report also says that “the higher global foreign exchange market turnover is associated with the increased trading activity of “other financial institutions” (think retail forex brokers). Turnover in this category rose 42% and for the first time ever, reporting dealers (banks) did more transactions with “other financial institutions” than with other banks. Having just come back from Singapore where shelves and shelves were filled with forex trading books, I am in no way surprised that the BIS has confirmed the popularity of forex trading. 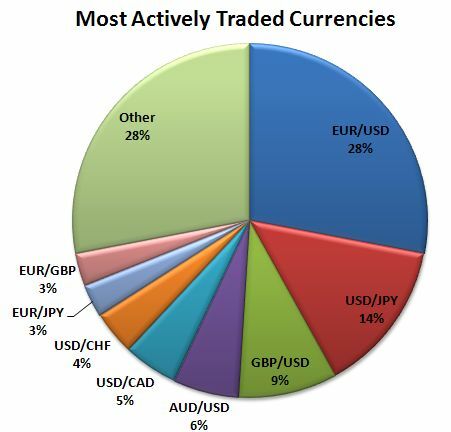 The foreign exchange market also became more global with cross-border transactions representing 65% of trading activity in April 2010, while local transactions account for 35%. Of the major currency pairs, trading of EUR/USD and USD/JPY have increased while trading of the GBP/USD has decreased. 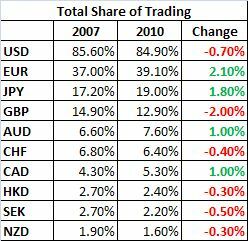 The U.K. is still the largest trading center for forex but the relative ranking of foreign exchange trading centres has changed slightly from the previous survey. The United Kingdom continued to be the most active location with a share of 46% of worldwide trading, followed by the United States with a share of 24%, slightly down from 2007. Outside these two centres, trading took place primarily in France (7%) and Japan (3%), both slightly down from 2007, Singapore (3%) and Switzerland (3%), both slightly up. Turnover in Germany almost halved to less than 2% in April 2010 compared with 2007. Banks located in the United Kingdom accounted for 36.7%, against 34.6% in 2007, of all foreign exchange market turnover, followed by the United States (18%), Japan (6%), Singapore (5%), Switzerland (5%), Hong Kong SAR (5%) and Australia (4%). However the pace of growth will most likely be moderated by the reduction in leverage announced in the U.S. and Japan. Last month, Japan reduced leverage to 50:1 and plans to bring this down even further to 25:1 next year. U.S. regulators announced earlier this week that leverage will be capped at to 50:1 for major currencies and 20:1 for all other currencies. This will go into effect on October 18. Lower leverage will make forex trading less attractive to some participants but 50:1 is still very generous leverage by all counts and so it will not be catastrophic for the retail forex industry. We should still see retail trading contribute positively to forex volume, but probably not by the double digit levels seen in past years.